“Secrecy,” says American fiction writer, Robert Heinlein, “is the beginning of tyranny”. But I think, secrecy is actually the abode of darkness, ignorance, prejudice and confusion. Because whatever is held in secret is like something held in the dark- it can be anything, it can become anything. It can become nothing. As the Afghan Government continues its wooing overtures to the Taliban, and Karzai whines about “foreign interference” in his latest meddling in Afghan parliamentary democracy, the Taliban execute a couple by stoning them to death in Kunduz province in front of a crowd of hundreds. The crime? The couple fell in love and attempted to elope, beyond a community where relationships based on mutual love and attraction, and not on money and perversion, might have a chance of fulfillment. On January 11, 2011, I led a team of police officers who rescued an 8 year old girl, Esther Obot Moses, in a remote village, Nsit Ubium, in Akwa Ibom State in Southern Nigeria. Esther, according to locals, was accused of witchcraft and abandoned by her family. She was sleeping in the local market till a 40 year old man, Okokon, ‘kidnapped’ her. Police arrested Okokon who is believed to have some mental problems. He has been living with Esther in his shanty building since last year, and he raped her several times. On Tuesday January 11th around 5pm, I was arrested along with my driver and a photographer in front of a bank in Uyo Akwa State in Southern Nigeria . I arrived in Akwa Ibom on Sunday, January 9 to rescue two alleged witch children abused and abandoned by their families. 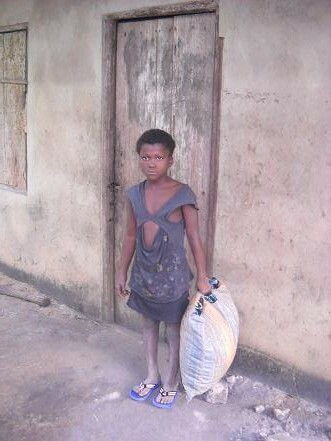 One of the kids, 8 year old Esther Obot Moses, was living with a mad man who raped her several times. On that ‘fateful’ Tuesday, around 5.40 am, I stormed a dilapidated building in Nsit Ubium where the lunatic lived with two police officers and successfully rescued the poor girl. We went to the police station, made an entry and got a police extract. I recently chanced upon Scientists Anonymous: Great Stories of Women in Science (2005), by Patricia Fara, Senior Tutor and Director of Studies in History and Philosophy of Science, Clare College, Cambridge. Aside from her several popular books on science, Dr Fara is relatively well-known in the UK for her contributions to Melvyn Bragg’s BBC Radio 4 series “In Our Time”, on which she has featured on seven occasions in the years 2008-2010. Scientists Anonymous is published in the series Wizard Books (the children’s imprint of Icon Books), and is designed to be read by teenage schoolchildren. This to some extent dictates the style the author has chosen, and she succeeds in making it a very readable book. From John R. Shook, The God Debates: a 21st Century Guide for Atheists and Believers (and Everyone in Between). (pp 16-18) Wiley-Blackwell 2010. Published by permission.